Are you tired of being called “cute” because you have round cheeks? People with rounder faces often look chubbier than they actually are. So, girls, if you want to experiment with your look and slim your face down, try these easy tricks! Bigger eyes make your whole face look longer and thinner, so use this simple trick to make your eyes pop. Apply a light or neutral eyeshadow on the inner corners of your eyes and a dark eyeliner on the upper lash line. Curl your eyelashes and apply mascara to make them look bigger. Voila! You have bigger eyes that elongate your face. You can also try the Korean puppy eyes eyeliner trick to really open your eyes up. Contouring your face takes practice, but it’s not very difficult once you get the hang of it. To contour your face using just powder compact, invest in one that is a shade darker than your natural skin tone (we’re loving this one by Coloressence). 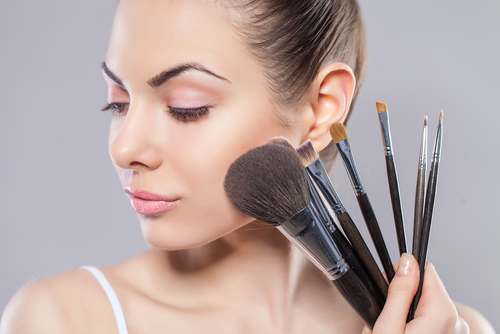 Use a makeup brush to lightly dust the sides of your nose, your jawbone and your temples with the powder. Your face will look slimmer instantly. 3. Contour With Three Colours! To give the illusion of high cheekbones, contour your face using these three makeup products - a cream blush, a bronzer and a highlighter. Use a cream blush on the apples of your cheeks and a highlighter on top of your cheekbones for that glow. Then finish with a bronzer below your cheekbones. This technique will make your face look narrower by giving you super model-esque high cheekbones. This is easily one of the simplest ways in which you can make your face look thinner. Long earrings slim the face down along the vertical line. So don’t shy away from those pretty long danglers. Flaunt them and see the difference in your face. We know how amazing straight hair can look, but sometimes straightened hair lies flat around the face. This can make your face look rounder. To avoid this, tease your hair up near the crown to add volume. Also make sure that your hair is not greasy, as greasy hair also lies flat around the face. Your eyebrows play a huge role in determining how your face looks. While most of us clamour for really thin eyebrows, they are not a very good idea if you want to slim your face down. Use an eyebrow pencil to fill your brows in and shape them correctly. Just try to retain the natural thickness of your eyebrows when you get them waxed or threaded, and remove only the stray hairs. After that, use a pencil to create angular brows that will slim your face down.